I'm curious, sometimes I'm working on Gmail (using Google Chrome), and Flash Player crashes. When this happens my YouTube video tab stop shows the video, and Gmail doesn't stop, but it does show the "Flash crashed" message, as if it were using it for something. Any idea if Gmail uses Flash, and for what? Gmail uses Flash for file upload and voice/video chat, I believe. Nowhere in Gmail's source does it mention Flash. I did a little more digging and it appears that you need Flash though if you want to use the voice or video chat. It may use Flash in some advanced features in composition. Where do you notice you are in Gmail when the crash happens? It also uses (or at least used to use) Flash to play the notification sound when a new chat arrived. Macromedia Flash must be enabled on your computer if you'd like audio notification for each incoming chat. Voice and video Chat require Flash. If you open Google Chrome background pages view, you can see that whenever you load the Gmail page, the Shockwave Flash plugin starts to run. 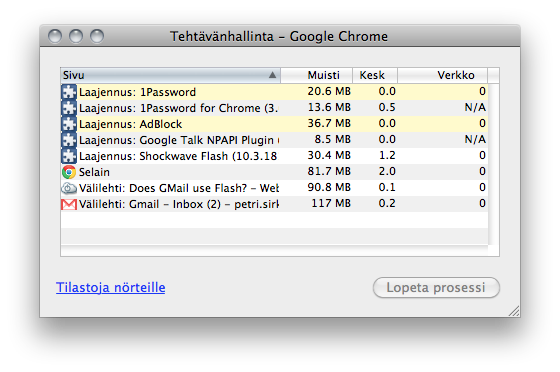 Also if you kill the Shockwave Flash plugin there, it will notify on the Gmail tab that the process has problems. Gmail uses flash for the chat feature. There are some bugs noted, just read about one today that can cause a USB bus crash. I do not know what Google uses Flash for in Gmail, but when I have the Flash Player plugin disabled in IE8, I notice the information bar telling me to run the Flash Player plugin. This is on the login webpage for Gmail. Not the answer you're looking for? Browse other questions tagged gmail flash or ask your own question. How can I get Gmail tab to flash (in Firefox) when I've got a new mail or chat? View YouTube videos in Gmail?